This unit has a child age limit of 15. Please ensure no-one over this age uses the equipment. No adults are to use this Bouncy Castle. 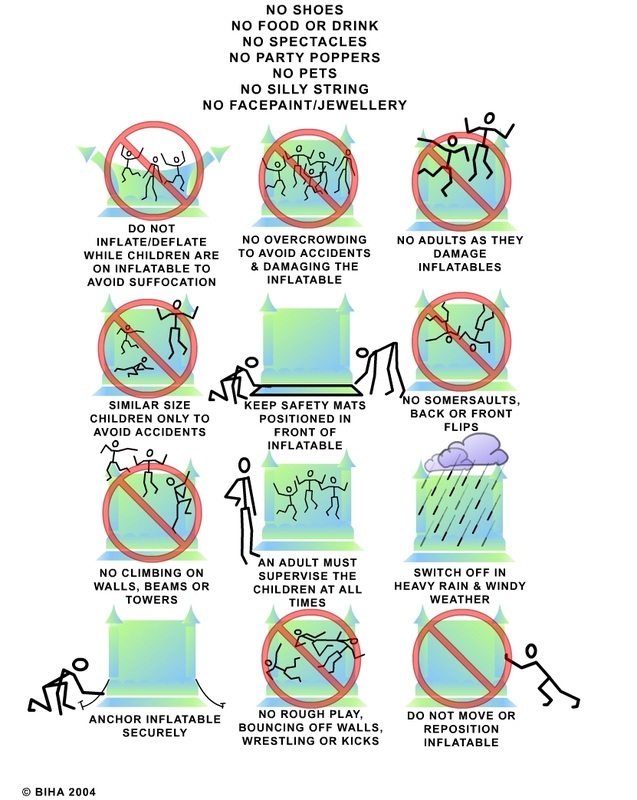 No food, drinks or chewing gum to be allowed on or near the Bouncy Castle. Please note if the Inflatable is collected in a dirty condition then the person hiring it could incur a cleaning charge. Always ensure that the Bouncy Castle is not overcrowded, a maximum of eight children must use the castle at any one time. Try to avoid large and small children from using it at the same time. Always ensure children are not pushing, colliding, fighting or behaving in a manner likely to injure or cause distress to others. Ensure that no-one with a history of back or neck problems is allowed on the Bouncy Castle and also any child who is feeling unwell. The Bouncy Castle should not be used if it becomes wet on the jumping area. In the event of rain, the unit should not be used. In the event of heavy rain , it is strongly recommended that the Bouncy Castle be switched off. Any wetness, including bubbling (which is normal) can be dried with a towel. In the event that the blower stops working, please ensure all users get off the inflatable immediately . Check the fuses and make sure the blower tube or deflation tube has not come undone or something has not blown onto and is obstructing the blower. In the event that it overheats, or loses power, switch the blower off at the mains, then switch it back on again 1 or 2 minutes later, and it should restart. If it does not, inform us straight away.